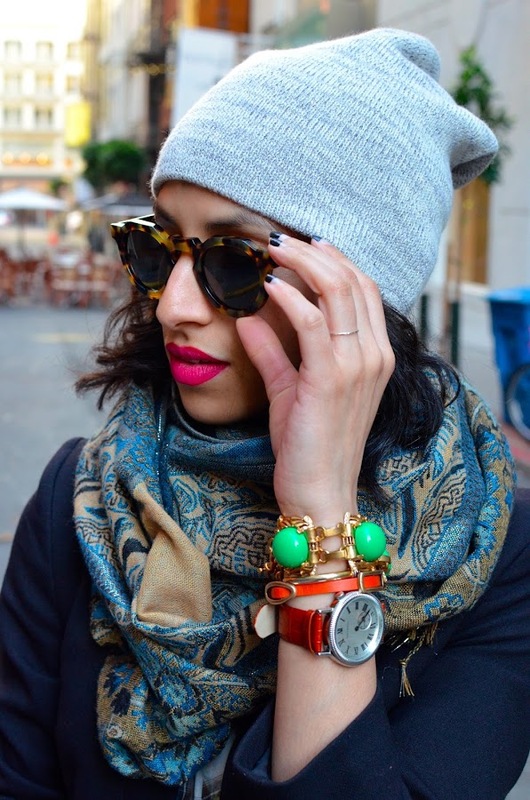 I think I saw this styling trick on a blog somewhere around NYFW and it sort of blew my mind at how simple it was. Everyone has striped tops and almost everyone has lace (mine is actually a dress I tucked in! ), it just couldn't have been an easier pairing! 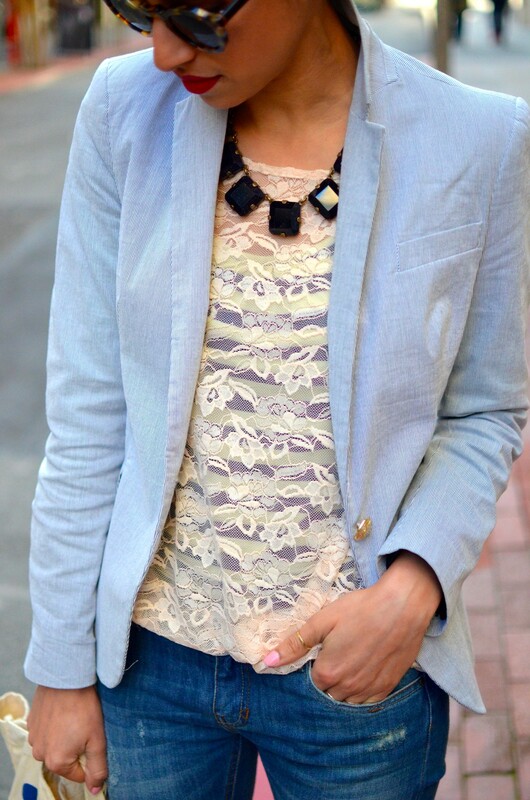 Speaking of lace- stay tuned for the winner of the Tart collections lace top. If you didn't already assume- I love to layer. 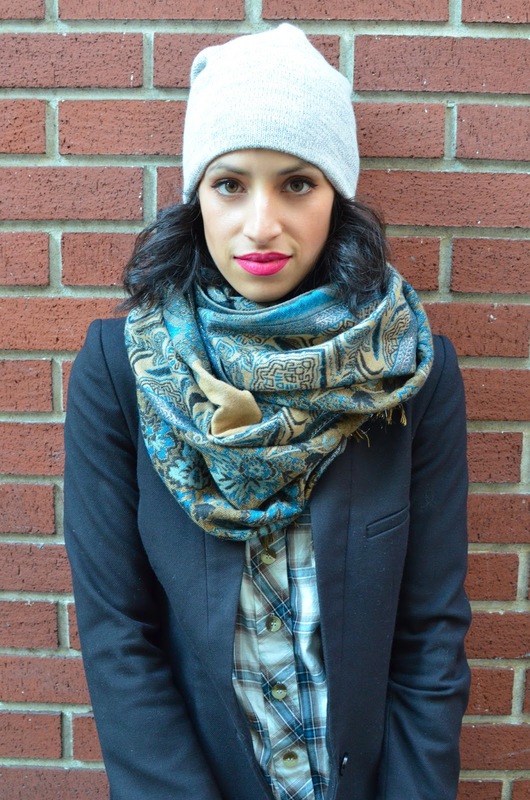 So I'm thoroughly shocked that I didn't think to pair these two layers earlier on this winter. 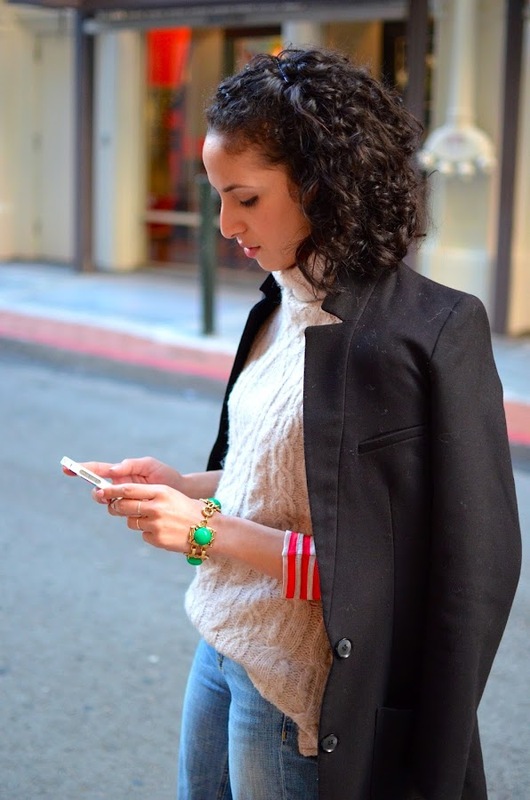 I generally wear this bulky faux fur vest over a jacket, but never under. When I tried it, it just made sense, and in my opinion a bit chicer and more elegant. I even got a "Your'e looking a little like Mrs. Robinson today" from the bf- I'll take that as a good thing. With the pops of color, and a little chain purse worn cross-body style this possibly intimidating-to-wear look gets streamlined, and takes on a fresh spin on winter-wear. Keep the rest of this over-the-top look simple- pair with skin-tight leggings and flat loafers to make the peek of fur under this fabulous coat the star of the show! One day left to enter my Tart giveaway!! 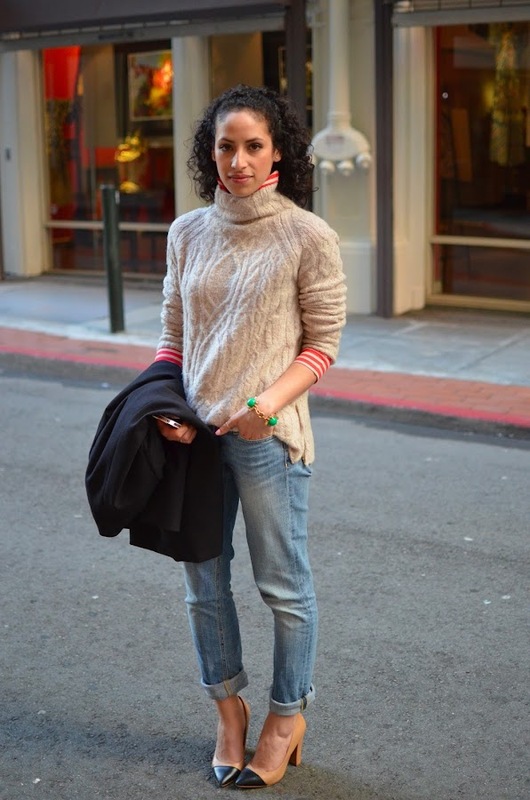 When else can you layer two turtlenecks over each other- if not on a San Francisco Winter day? 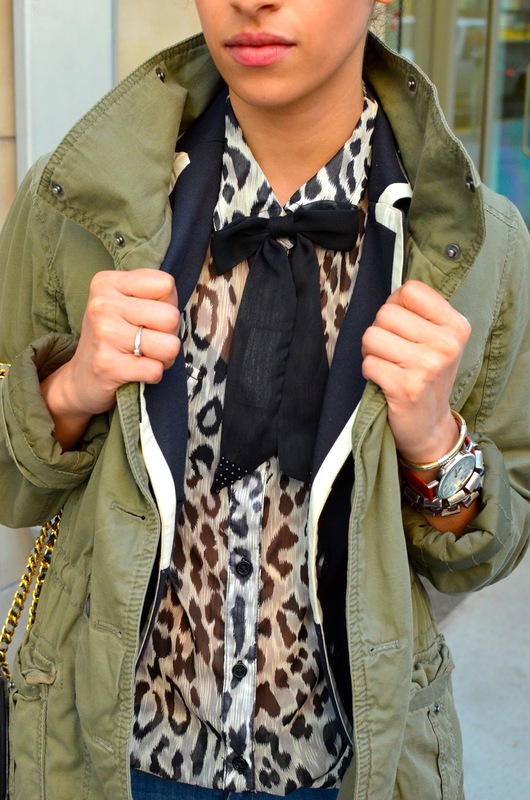 But, as much as I love to layer- doesn't it just make an outfit so much more interesting?- I sure can't wait until spring! 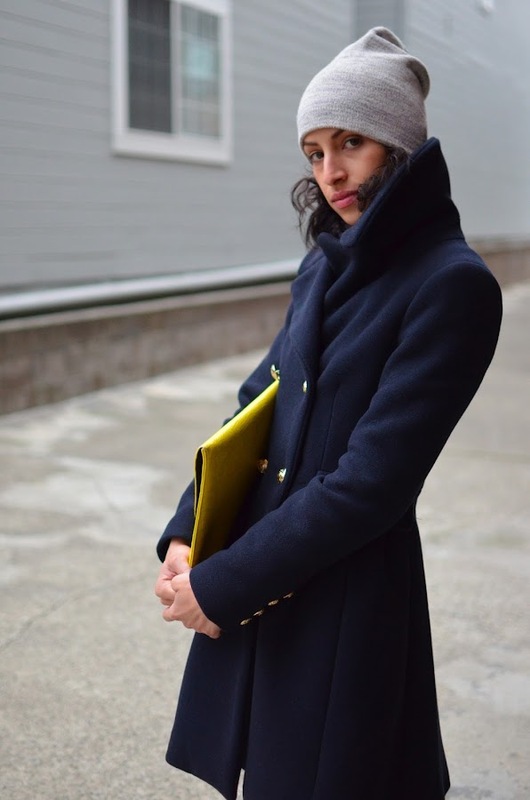 Rarely do I find a coat I want to keep on while indoors. 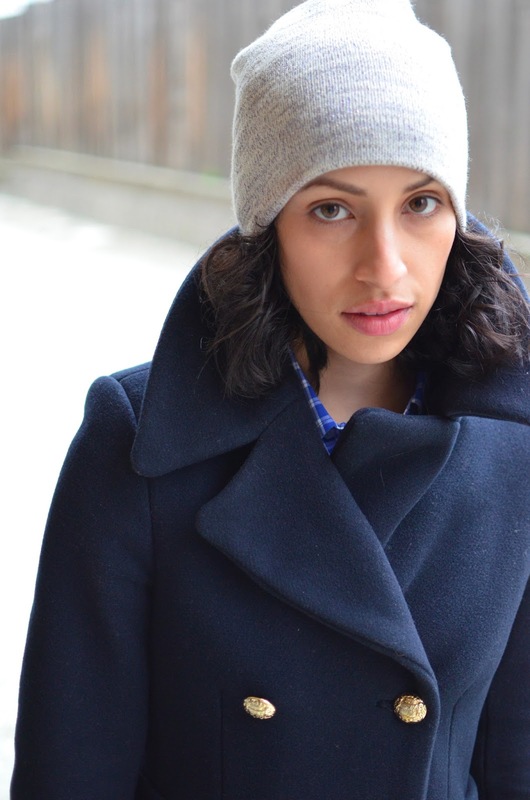 Coats are perfect layering pieces, and are great at keeping the cold at bay, but they generally aren't outfit-makers for me. 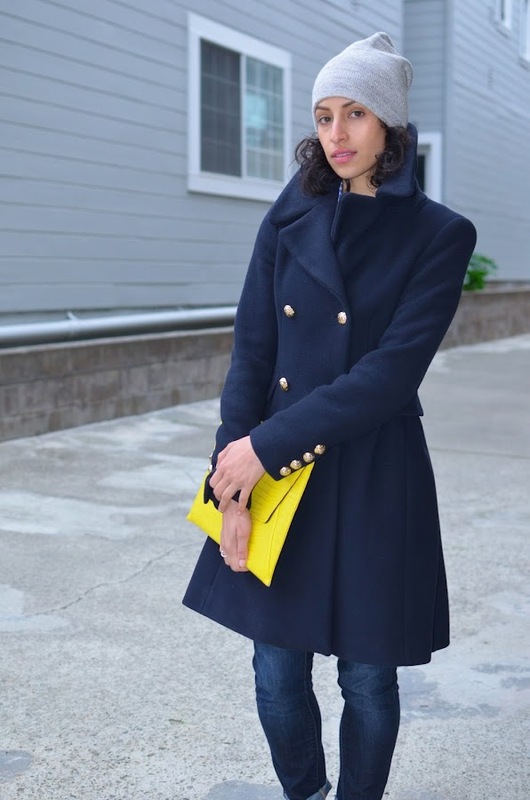 But this navy peacoat style is slowly changing my mind about that notion. Paired with my favorite beanie to add some fresh style to the elegant coat, as well as some sassy studded loafers- this outfit may be on repeat soon! Or at least the coat will. Still time to enter my Tart Collections giveaway!! For the most part, this blog is about my outfit choices, and trends I'm experimenting with in my wardrobe. So here, in the 'My Moments' series is a few sneak peek's into my life- things that make me happy, tid-bits you might not now about me, and/or really great finds you just need to know about! You probably don't know this but I'm a huge magazine fan! As soon as I told my dad I wanted to work in fashion he subscribed to every single fashion rag he could get his hands. 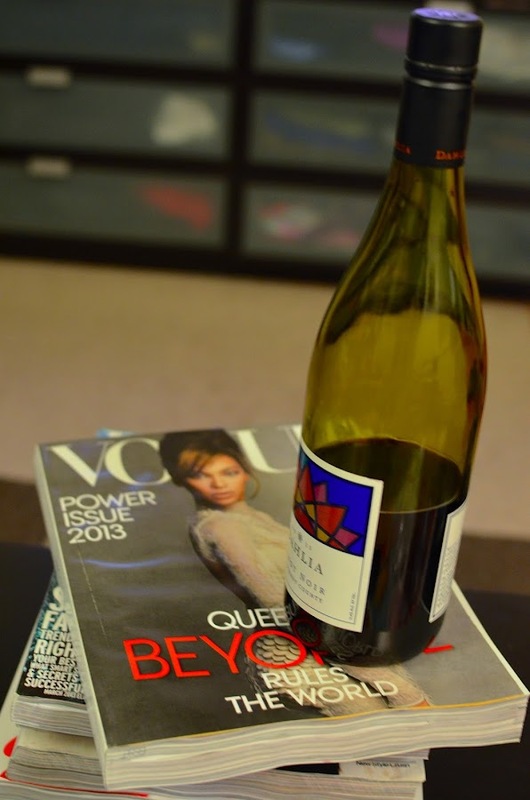 So here is my giant pile waiting to be read, with my libation of choice- good red wine. Cheers! My very first PopSugar Must Have Box- full of goodies! Have any of you ladies tried it out? It's official- I've found the perfect pink paste hue! Juno by Milani. One of my favorite feelings- a fresh mani in a really good color. Both of these are favorites from Milani- Juno and Beach Front. When J. Crew predicts the next big thing is none other than a super-comfy-can-be-layered-over-anything-utility-jacket, you jump to try out this trend. Especially when said utility jacket is already in your closet! 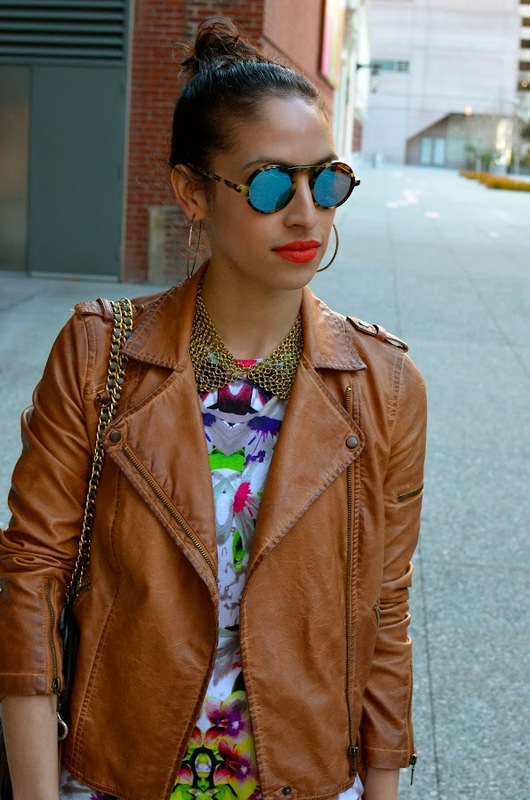 And just in case you were wondering- this outfit is totally rock-able. I felt very cool all day wearing this look, the extreme laid-back outer layer is a total compliment to the inner polished bow-tie and blazer combo. 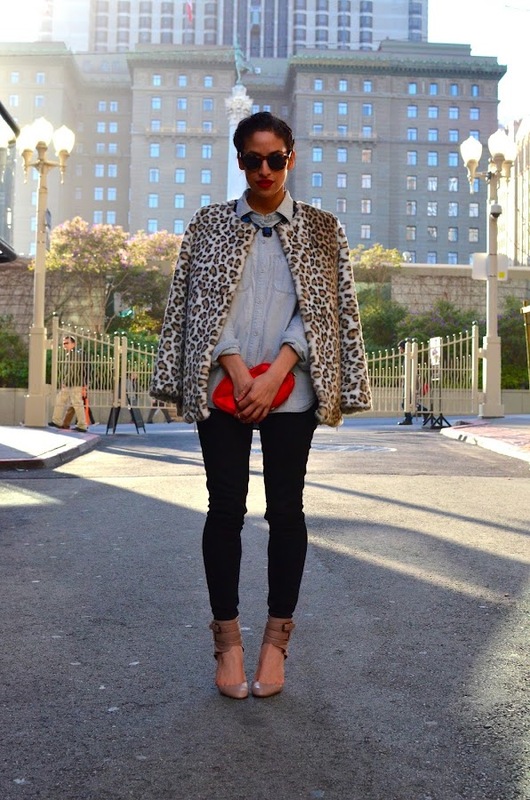 Add the skinny jeans (my denim go-to), a sensible pair of chic walking boots, and behold- the perfect Monday outfit! Still time to enter my Tart Collections giveaway! Are you in it to win it?! Have you entered my amazing Tart Collections giveaway yet?? Happy Valentine's Day lovers! Yesterday I donned a little after-hours lace, and today we have some day time fur! Yes, I actually wear this stuff to work, and I think my colleagues just might actually appreciate it. Funny story about this coat- I found it in the kids section, on super sale- I had to get it. I'm hosting a fabulous Tart giveaway- have you entered yet? p.s. 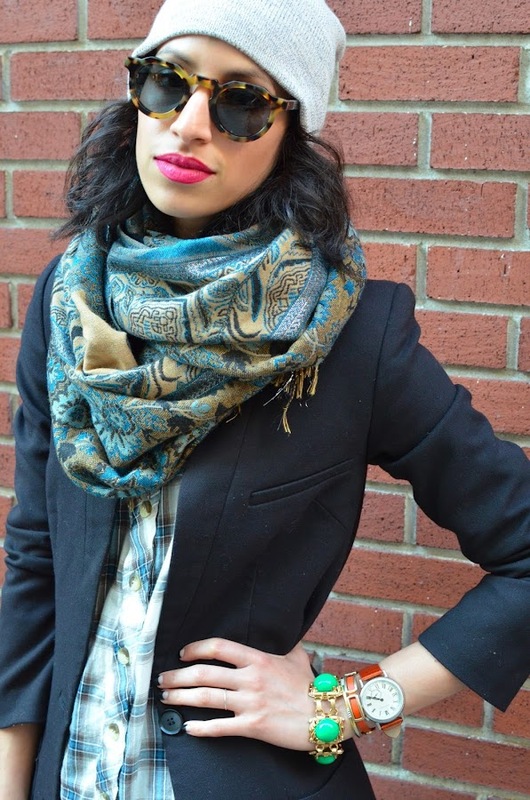 Have you heard the good news about blogger extraordinaire, Holly Foxen Wells from GlamourMash? She recently opened up an amazing Etsy shop- and it's chalk full of the most beautiful geometric necklaces I've ever seen! Check it out here! While I'm generally not a all-black-everything kind of girl, I do enjoy getting all little more glam than usual once in a while, and black it definitely the sultry color to do it in! Remember last week when I told you I was headed to the symphony? This is what I wore. It was simple, and elegant. The zippered skirt and the peek-a-boo lace sleeves gave it just enough edge, and the pops of color made the outfit more me! All in all my guy really liked it! Oh yeah, and one of you lucky ladies- gets to take home this fab top. It really is stunning, fingers crossed for all of you! Details below. My breakfast as of late. 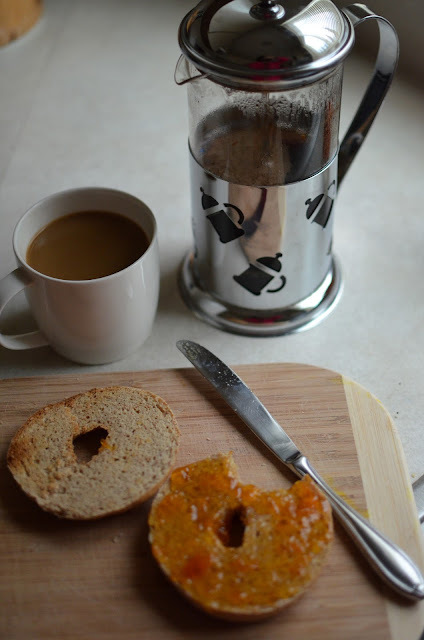 Whole wheat bagel with marmalade and coffee. Always coffee. Worn at least once a week- the perfect walking heel in a lush burgundy. Big hair. Red lips. 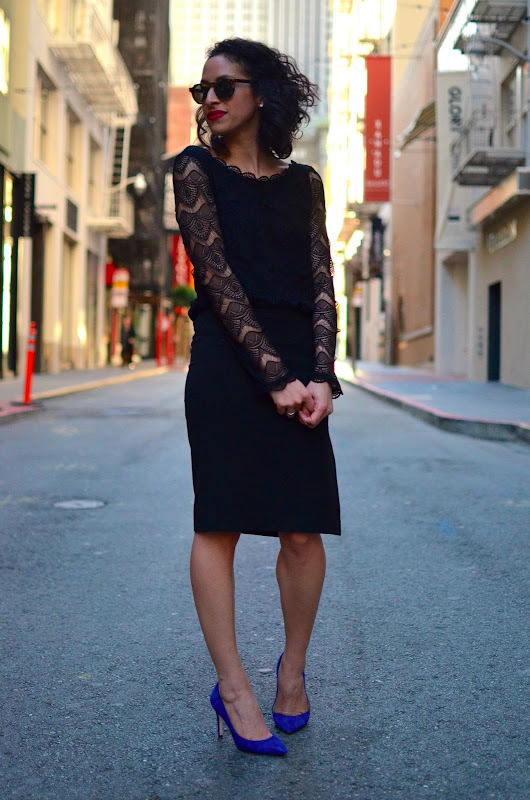 Black lace. Valentine's Day approved! Girl time with my bestie, and indulging in the most delicious Croque Monsieur I've had in a while. 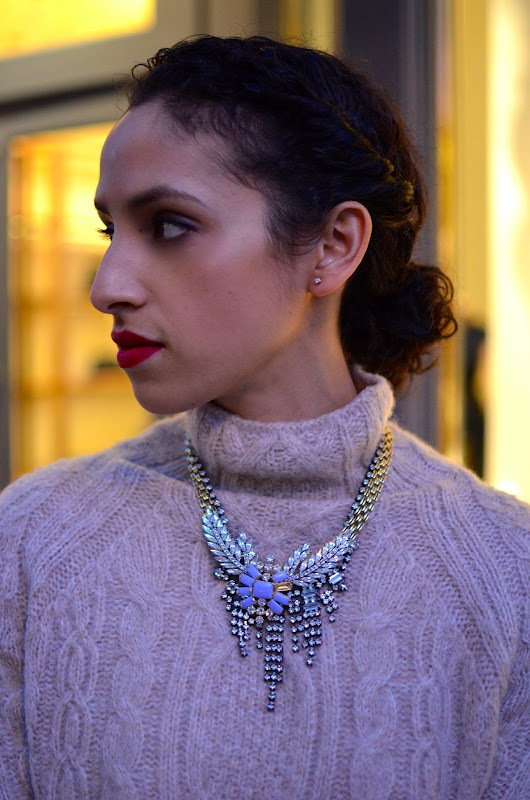 Weekend wear in blue tones, and more red lips. A cupcake shop just opened up in my neighborhood, and since I didn't want one giant cupcake- I got three little ones to try out. Red Velvet, and Fleur de Sel were my favorites! Seriously, my days have been turning into nights so fast- glad I remember to capture the moments that bring a smile to my face! When all gets a little too hectic, what makes you happy? I love how the pants and boots in this outfit are pretty much the same color- it's kind of like wearing thigh-high boots that go on forever! 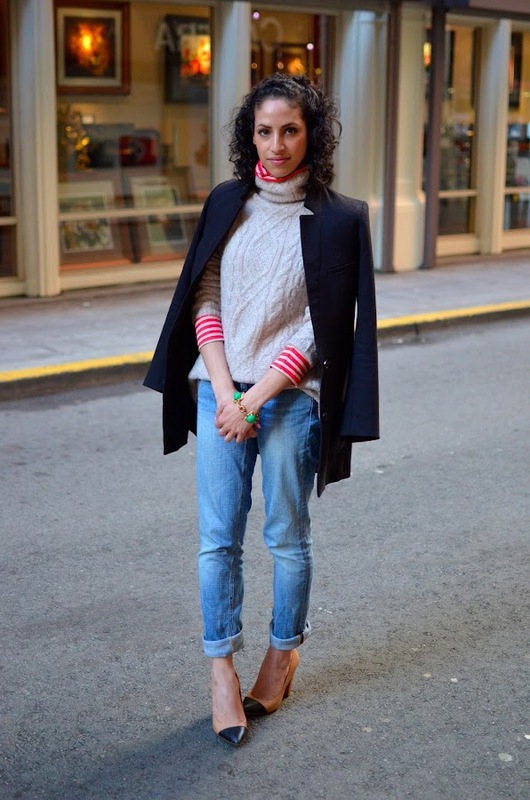 And paired with my new favorite turtleneck- it was definitely an easy outfit day for me. Hope you all have a fabulous weekend planned! I'm headed to the Symphony tonight, and getting my Valentine's Day Weekend on a little bit early.